I don't want to get into whether photography is art or not. Frankly, if it takes time, effort, skill and imagination and it is used to express something, then its art. Photography is a different form of art though. Unlike painting, music or dance, it's subtractive art. Photographers spend their time trying to figure out what to leave out of a picture, either during framing or in post processing. All other art is additive: the artist begins with a (relatively) blank canvas and works from there. Subject matters, regardless of what art takes your fancy. But in photography, you have to find it and isolate it from the noise of the messy world. In art, you start with the subject, but in photography you almost have to discover it. To illustrate, look at the before and after below. Convert to black and white, and adjust the tonal balance (itself a multi-step process using masks). A subject can be obvious (as below) or perhaps implied. Knowing your subject is important, because it anchors the process of subtraction, but it isn’t enough. You also have to say something about the subject, and this often means situating the subject in some sort of context, giving it a relationship to a secondary subject, the way a major character is revealed by relating it to a minor character in a story. From this, you can decide what matters and what doesn’t; what reveals your subject and what obscures it. Then it’s just a matter of subtracting anything that obscures and leaving in the things that reveal. 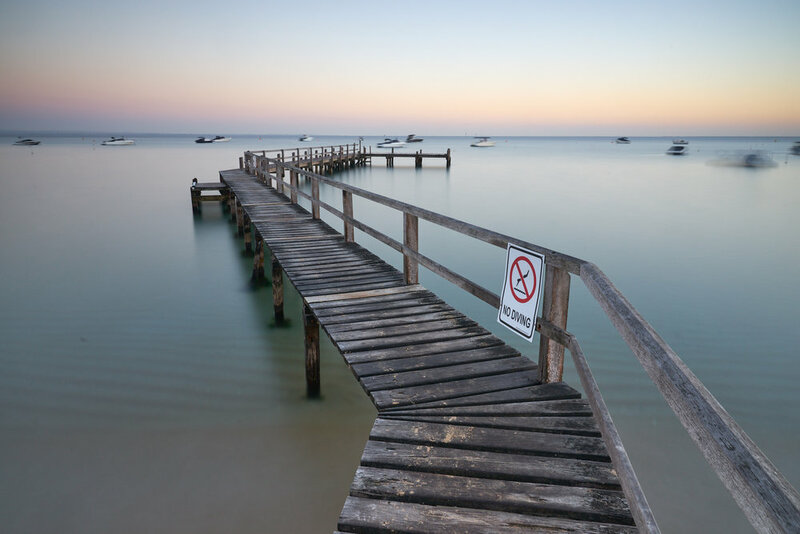 For this image the subject was obvious as soon as I saw it: after all, a crooked jetty is an odd sight, and this one had the added benefit of a sign that immediately stimulated ideas of risk and adventure. It took me longer to determine what I wanted to say about the subject, and that’s because it took me a while to connect the jetty and the warning sign to the empty horizon. But when I did, suddenly I knew that this jetty and the sign were a metaphor of sorts for our journey through life: fraught, unpredictable and finite. The connection between the jetty and the ocean and horizon beyond suddenly made sense, but all the boats and the colour didn’t. They diluted the narrative, and so too did the strong horizon line itself. This thought process happened partly as I took the image and partly once I’d begun processing the image, but once the metaphor was revealed the process of reduction I needed to make was almost inevitable. I had to remove the boats, and I had to soften the distinction between the sea and the sky. And, of course, I had the remove the colour. Once it was done, the story in the photograph was the only thing left.